"We've found all of the originals. The Commandant at the Airport is going to deprocess them one by one, starting with you, unless I stop him!" 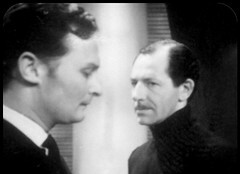 4 episodes of mystery, one of urgency and now an episode of bluff/brinkmanship as the Doctor tries to regain the lost humans while the Commandant bluffs, and then actually does holds a gun to the Chameleon's head. Somehow this story is lacking something: there's no urgency to the first few episodes even when the Doctor's companions start disappearing and indeed Ben & Polly hardly get a mention after that. 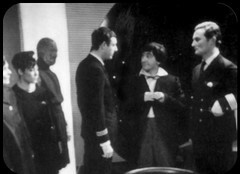 Then at the start of episode five everything gets a bit manic, the deadline of the last flight of the season emerges which is rather odd as we now know this story is set in July and most Englishmen go on holiday in August! A little restructuring with more urgency earlier on would help. I suspect my opinion may be changed if we could see more of it: the Chameleons are supposed to be an impressive visual sight but very little of them is visible in the surviving episodes. It's only in this episode that they identify themselves as Chameleons, and even then it's only in terms of "This is Chameleon Headquarters" so they may well still be referring to their front company name and the actual name of their race has gone unmentioned. So why did we not see Ben & Polly between episode 2 and their brief appearance here? DOCTOR: Doing? I'm looking for the Tardis, of course. POLLY: Oh, no. Can't we stay in London a bit? BEN: Yeah, it's good to feel normal again. DOCTOR: Normal? What do you mean, Ben? BEN: Well, no monsters, or Cybermen. All this, it's normal. I understand it. DOCTOR: Do you? What about Chameleon Tours? BEN: Oh yeah, that was different. JAMIE: Oh, I'll be glad to get away from here. Can you not land us in a nice civilised place like 1750? POLLY: What's so uncivilised about 1966? JAMIE: Oh, you can keep it! BEN: Did you say 1966? BEN: What month is it? DOCTOR: It's July. July the 20th, to be precise. POLLY: What are you getting at? BEN: Don't you see, Duchess? July the 20th, 1966 is when it all began! We're back to when it all started. Well, I think. POLLY: That means it's as if, it's as if we've never been away. DOCTOR: You really want to go, don't you? BEN: Well, we won't leave, Doctor, if you really need us. POLLY: The thing is, it is our world. DOCTOR: Yes, I know. You're lucky, I never got back to mine. All right, then. Off you go. Now go on, Ben can catch his ship and become an Admiral, and you Polly, you can look after Ben. POLLY: I will. You will be safe, won't you? JAMIE: I'll look after him. BEN: I'm sure you will, mate. Goodbye, Doctor. BEN: We might see you sometime. Take care. DOCTOR: Well you'd better hurry. The Commandant's car waiting. JAMIE: I'm sad to see them go. DOCTOR: Yes, Jamie. So am I. 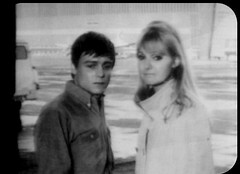 What happened is that Anneke Wills and Michael Craze left the series following episode 2: their appearance here is courtesy of the location filming recorded before the studio sessions. 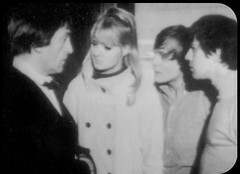 <Anneke Wills led an interesting life both before and after Doctor Who and has been producing a series of autobiographies. Michael Craze married Edwina Verner, a production assistant on the program who he met on the set of Tenth Planet, but later left the acting profession and ran first a pub, then a hotel. He died in 1998. DOCTOR: Well, we've got things to do. DOCTOR: Well, I didn't tell the others, but we've lost the Tardis. JAMIE: We can't have done. DOCTOR: It was outside. It's not there now. JAMIE: You mean somebody's stolen it? DOCTOR: I don't know, but that's what we're going to find out. Come on! This episode leads directly into the first episode of the next story with the Tardis being stolen, not an uncommon device in the sixties. But this episode is also established as taking place on the same day Ben & Polly left Earth. So on the space day at least THREE forces are in operation in the London area: WOTAN & The War Machines, the Chameleons, and the protagonists of the next story: The Daleks. So the Doctor's premonition in The War Machines, similar to what he feels when the Daleks are nearby, may be due to there *actually* being Daleks nearby! It's also possible that there might possibly be an escaped Yeti hiding in the Underground ahead of the Web of Fear as well as an advance guard of Cybermen in the sewers!